Today we continue our "White List" as we cover the musical settings for the Ordinary of the Mass that appear in Gather Comprehensive - Second Edition, published by GIA Publications of Chicago, Illinois. 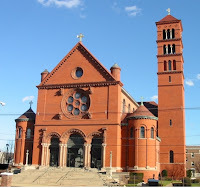 Music List: This past Sunday I did some substitute work at the church pictured at left - Blessed Sacrament in Providence, RI. Beautiful Romanesque church with an Aeolian-Skinner organ. The list in question is for the Solemnity of the Epiphany. Impromptu ripoff on Wie Schön Leuchtet, played by yours truly. Feasts for the Week: St. Raymond of Peñafort; St. Hyginus; Baptism of the Lord. For more information: New Advent Website. Suggestion Box: Baptism of the Lord. For more information: CanticaNOVA Planning Pages. WHAT PART OF "NO" DON'T YOU UNDERSTAND? 70 X 7 IS WHAT??? GOTTA LOVE A GOOD UNIT! HOW NOT TO USE PISTONS? EVER HEAR OF "HERE I AM, LORD" IN LATIN? COUPERIN BETWEEN HYMN VERSES - WAY COOL! HOW MUCH DO YOU KNOW ABOUT CANDLEPIN BOWLING? DON'T BLINK! YOU MIGHT MISS IT! GET YER TICKETS WHILE THEY'RE HOT! A NEW WAY OF RENDERING HANDEL'S "HALLELUJAH"